Join Ramdesh for this informative show and learn all about the chakras—subtle energy centers within the body. She’ll share mantras that support each chakra on this fascinating journey. 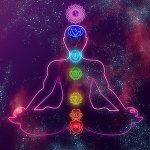 Ramdesh explains that there are many methods of balancing the chakras; when they are well balanced the result is increased vitality and increased health and happiness: “Kundalini yoga provides a very quick, direct and straight stairway to heaven but it’s not the only one,” she points out. The first chakra lies in the area of the base of the spine and is associated with the color red. This chakra is related to instinct and survival and deals with fear, a sense of lack, and very basic emotions. The mantra Ramdesh has chosen for the first or “root” chakra is the Mul Mantra and the selection is from Anand by Snatam Kaur. The Mul Mantra eliminates fear and is a fate changer; it stops karma in its tracks. Listen to “Mul Mantra” and know that you are supported by the universe; you have everything you need. The second chakra, associated with the color orange, corresponds to the reproductive and sexual organs. This chakra, Ramdesh explains, deals with creativity, procreation and relationships. When this chakra is out of balance it can cause us to be hypersexual or become involved in shallow relationships, characterized by jealousy, guilt or possessiveness. Or one might go to the other extreme and reject one’s feelings of joy, sensuality, and joyful creativity. It’s important to keep this chakra balanced to have happy, fulfilling relationships. To balance the second chakra, listen to the Adi Shakti Mantra, which calls upon the divine mother and the force of creativity. The track is “Adi Shakti” by Aykanna from Mother. The third chakra, associated with the color yellow, is also called the navel chakra and is located behind the belly button point. The Sanskrit word for this chakra, Ramdesh reveals, is manipura, which means city of jewels or lustrous gem. This is the power center, the sun energy point that is the fire that stimulates all our other centers, our body, and our chakras, and keeps us charged up and energized. It’s the fire of the third chakra that allows us to raise the energy of the Kundalini, the energy of consciousness, awakening, and enlightenment, Ramdesh explains. 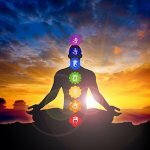 The third chakra relates to the digestive system; it is also the place where prana (the energy of life) and apana (the energy of elimination) meet. To clear this chakra, listen to the mantra “Prana Apana” by Simrit Kaur. The ability to give and receive love is found in the fourth chakra, which is associated with the color green, and is also connected to healing. 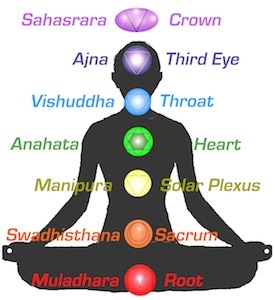 The fourth chakra is the center point between the three lower chakras (called the lower triangle), and the three upper chakras (the upper triangle). “This is where we connect our heavenly selves with our earthly selves and if we unify the elements of the heavens with the elements of the earth and live from the heart center then we are really living a balanced, healthy, truly human life,” Ramdesh says. The mantra she has chosen to represent this chakra is Guru Ram Das, after the fourth Guru of the Sikhs, who was a paradigm of love, healing and protective energy. This “ light and funky” track is called “Guru Ram Das Mantra (Disco Mix)” from Akal Groove by Amanbir Singh. At the fifth chakra— in the area of the mouth, throat, and ears—the path of the Kundalini as it rises gets a big tricky, Ramdesh points out. The color is blue, and the chakra relates to keeping your word, speaking truth and kindness, honoring others, and doing no harm. To open and soothe the throat chakra Ramdesh has chosen the mantra “Humee Hum Brahm Hum” which connects you to the divine through the spirit of divinity and wholeness. The track is by Gurujodha Singh from Kirpa. The sixth chakra, also called the third eye, is situated between the eyebrows and relates to wisdom and intuition. “Ong Sohung,” which means “I am Thou” is the mantra to help light our way and see our own highest path; the selection is by Snatam Kaur from Shanti. In closing, Ramdesh has chosen the beautiful “Ether Tattva Waheguru Mantra” by Nirinjan Kaur from Prem Siri to clear the seventh chakra; this connects us to the experience of infinity. 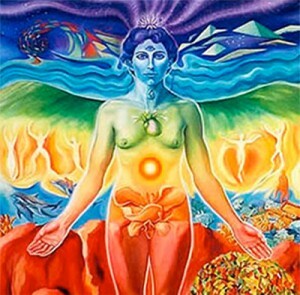 When our Kundalini energy expands out through the seventh chakra we become enlightened and awakened. 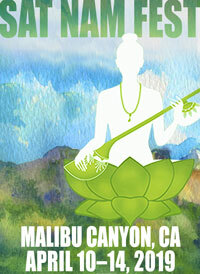 Awaken and balance your chakras on this lovely journey of music and mantra with Ramdesh. Feel the contentment and joy as the subtle energies within your body flow freely with grace, balance, and ease! Thanks a lot!!!! I’ll be waiting for it! Sat nam! Sat nam! 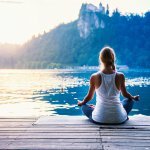 I just listen the podcast of a jorney througth the chakras, and I love the mantra “Prana Apana” by Simrit Kaur, where can I get it? I’m from México, so i prefer to download! Thanks so much for your help! It will be on Simrit’s upcoming album, Anand Dev Kaur!